5 March 2010, at 10:06a.m. IRAN - Broiler production in Iran has developed very fast in the last two decades to become the most important sector in animal production. To provide poultry manager with a comprehensive overview of state-of-the-art equipment Mr Sahvani from the renowned company Fara Gostar Disinfection Co. and the agricultural ministry of Hamedan recently organised a seminar in Hamedan, 300 kilometres south-west of Tehran. The Ministry of Agriculture also invited Big Dutchman sales manager, André Mofid, to introduce the company's equipment and to provide valuable tips and tricks for a successful broiler management. On his side was the general manager of Bakhtar Co., Big Dutchman's sales representative in Iran, Ali Jahedi. 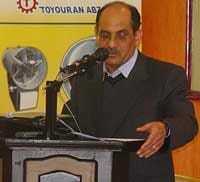 The Minister of agriculture of Hamedan province, Dr Darai, as well as 150 poultry managers attended the seminar. As well as comprehensive information on best practices for efficient broiler management and suitable equipment, the German poultry expert also touched on the topic of energy efficiency. This issue currently plays an important role among Iranian broiler producers, and for good reason. Over the coming years, the Iranian government is going to cut gradually back on subsidies. Therefore, the farm managers present were highly interested in detailed information pertaining to this issue. "The development of energy-efficient equipment has already been an important field of activity with Big Dutchman for a long time," said Mr Mofid, explaining the sound expertise the German world market leader has been accumulating in this regard. The broiler cage AviMax which turned out to be of particular interest to the participants is one of the examples. The main feature of AviMax is the easy-to-use tilting floor that facilitates the moving-out process. It allows for a low overall height of the installation while providing maximum headroom in the bird area. This makes for low energy and building costs, higher stocking densities, and optimum air exchange.